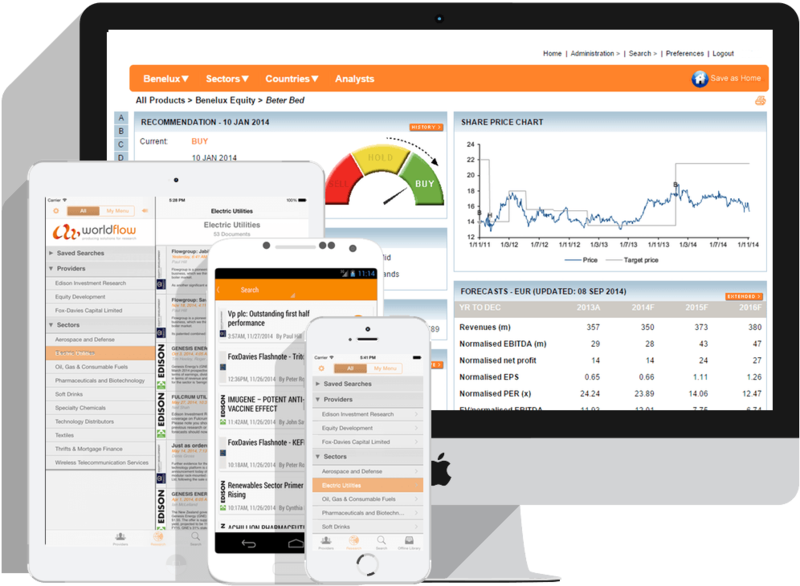 Ideal for Buy-Side firms to deliver research to Staff and Clients, reduce emailed Research and track usage of all Internal and External Research with onward provision direct to your Clients Read More…. Getting your Research read, valued and paid for is a key part of the research business. The Connect solutions from worldflow are a modular and flexible set of services designed to solve those issues. Having your Research easily accessible and discoverable for clients is key. Utilising a combination of one or more of a Research Portal, Native Apps, Email with tracking and link-backs, push to Aggregators, consolidated readership all backed by flexible Authoring, whether Connect Compose or another industry solution, are what we solve for. Provide customers with direct access to your research, commentary, news, charts and other content through dedicated Web Sites and native applications for tablet and smart phone devices. Keep clients up to date with your latest news and product release information with email distribution tools. Broaden your reach with multi-channel and social media publishing i.e. Twitter, LinkedIn, Facebook. Gain insight into client demand with Surveys linked to your products and services coverage. Add value to client conferences with pre-event marketing, event management and real time publishing tools for web and mobile. Extensive analytics and usage reporting, helps you track key client access and respond to changing client focus. Modular and flexible solutions enable rapid build and deploy for faster returns. All services are white-labelled and delivered to meet your own brand standards. Connect is delivered as a fully managed service so requires no costly internal IT resources to manage. Replace costly in-house systems with one single solution. Solutions backed by worldflow’s experienced consultancy team providing business analysis, project management and post-delivery review to help you gain the most from each solution. worldflow Connect offers a complete solution for writing News and Blogs and other notes, with Templated content to ensure consistency, and with delivery to all Digital channels, and reporting of use across those channels. Read more …. Many buy-sides produce their own research, to complement research from the Sell-Side and Independent Research content. Utilising Connect’s ability to consolidate multi-vendor content as a simple service with full entitlement controls allows a buy-side firm to supply combined research to internal staff through Web, IOS, Android as a service.Read more….. Interested in our services? Want bespoke software built? See something you like?